Why is it that the ugliest mushrooms -- moreles -- are the most lovely and the most elusive of all? They don't appear until the "lilacs are the size of a mouse's ears" and then only after a light spring rain. A few days ago, I hunted them in the early morning hours, the ground was damp and the chill deadened my fingers and toes. They hid in decaying leaves, under crumbling tree stumps. I found one, then two then a great cluster, coned heads poking up through the detritus. Like those lost keys, you can't find morels in a determined "search," but only when you don't look too hard, just observe and let go. OK, there is a zen lesson in the hunt. Experience and knowledge of the woods helps. But like just about everything I've ever searched for -- love, laughter, friendship, the right word -- the morels I was after were right at my feet. 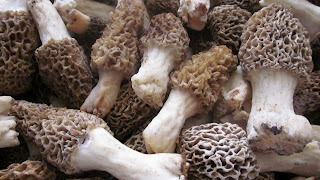 We filled a few paper bags with fat, fragrant morels that filled the car with the scent of spring morning and woods. I can't tell were we were, honestly, for the friend who drove me made me close my eyes when we got close. Morels need a good soak in salt water to remove the grit and any bugs. Slit them and let them dry well on towels. Then don't do much. Slice them and saute in plenty of good butter until they're nicely browned. Serve them on crostini or toast. Deglaze the pan with a little wine and toss what's left with pasta or just sop up the juices with good bread. You can store morels in brown paper bags in a cool dark place. Do not refrigerate, the moisture causes them to fall apart. Eat them as soon as you can, they don't last longer than a few days.